Microsoft Translator team has release a translation not for Windows Live Messenger, using this bot you can translate text from one language to other. Add mtbot@hotmail.com to your chat list. “You can have one-on-one conversations with the bot, or you can invite a friend and chat in different languages with the bot translating for you.” says the Microsoft Research Machine Translation Team Blog. You can also access windows live messenger on your smartphone to get translation on the fly. 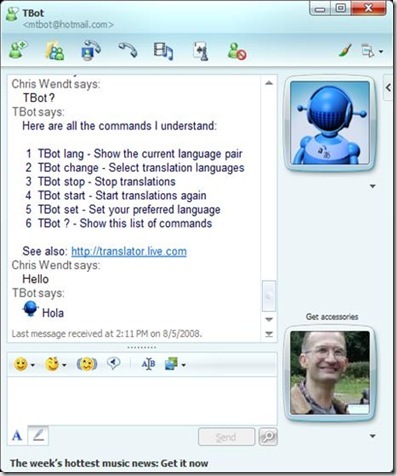 The translator bot is localized into all of the languages windows live translator supports. More language support will be added in the feature. To get a list of commands the bot understands just type “TBot?” while chatting with the bot.